UNDEFEATED RUNNING: RUN THE 2010 NYC MARATHON AND HELP KIDS ENJOY SUMMER! 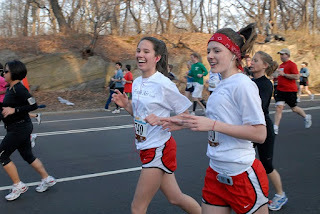 RUN THE 2010 NYC MARATHON AND HELP KIDS ENJOY SUMMER! Undefeated Running People! Listen up... Didn't qualify for the 2010 NYC MARATHON or get in through the lottery this year? Don't fret! Lottery's aren't easy to win and running Sub 3hr marathons aren't either... Here's your chance to gain entry to the 2010 NYC Marathon while helping inner city children enjoy their summer vacations! The FRESH AIR FUND needs you to do what you do and run... the 2010 NYC MARATHON. They will do what they do and help you to raise money through people sponsoring you for running 26.2 miles! Ideally, your families, friends, colleagues, x-girlfriends and x-boyfriends (or current ones), will find you and the FRESH AIR FUND a good cause to invest in. The Fresh Air Fund has been around since 1877 and over these years has given 1.7 million inner city children a brighter summer. They work with host families and Camps around the US and Canada to provide locations for children to experience a "real" summer vacation. Here's a link to the Fresh Air Fund's RUNNING TEAM page. If you have never ran with a charity team it is definitely something that you should do every couple of years as a runner. Check out THIS Undefeated Running post from January about charity teams. Use your running talent to help others, run for something other than yourself. It is more rewarding than you could imagine... especially, during those tough miles. It is also a great way to connect with other runner's and have a somewhat different (in a good way!) marathon experience. Just look at how much fun the Fresh Air Fund Runner's are having in the pic above... they must be on mile 24. So, are your ready to join the FRESH AIR FUND RUNNING TEAM?